On March 13, 1997 something extra-ordinary happened in the skies over Phoenix across Arizona. On that clear evening, a parade of low flying, mile wide V-shaped arrays of orbs and a craft glided silently overhead, attracting the attention of at least 10,000 people. As a result of the widespread publicity, and the fact the sightings occurred mainly over heavily populated areas, the controversy concerning what really happened back in 1997 in Arizona still exists today. Many theories exist to try to explain the strange sightings. Skeptics dismissed the sighting as military flares, and other types of military actions that they denied at first, until they realized there was a crisis that snowballed all the way to the President. The problem with the flares theory is that some of the reports of the sightings claim a huge size for the unidentified flying triangle which some estimated to me at least a mile long. The UFO event happened for three hours. It came in from the northwest part of the state, diagonally through Phoenix, down to Tucson, and then it turned around and came back. However, the UFO sighting is only part of the story. In the July 1997 issue of Scientific American, it was reported that on the night of the UFO event, bursts of gamma radiation, were detected by the Hubble Telescope. The gamma radiation was eventually traced back to somewhere within our own solar system. NORAD went Defcon 2 on the evening of March 13, 1997 after an Air Force Misti-3 satellite covering North America was disabled and had its batteries drained as a space borne object was observed passing over the satellite. Also on March 13, 1997, then-President Bill Clinton fell down and broke his knee while visiting the home of golfer Greg Norman. Clinton had to be rushed away in a helicopter and was kept at Bethesda Naval Hospital underground for over two days. There were press conferences showing diagrams of all the surgery that was going to have to be done and how long it was going to last and why he had to cancel his big meeting in Sarajevo with the prime minister of Russia. Just hours after these events, around 2 am on March 14, 1997, President Clinton was rushed to the hospital after suffering from a knee injury. Oddly enough , a few days later he’s walking around and he’s okay. The issue was dropped. Government secrecy theorists might be easily led to the conclusion that the broken knee was a cover story designed to hide the perceived need to get the commander-in-chief to safety in the wake of the unnerving events happening out in the Southwest desert. At the time it appeared that the aliens had arrived and the event was like a scene out of the movie, Independence Day, a movie that was a hit at the box office the year before the incident. A year before, a controversial film was released which depicted what appeared to be an alien on a slap being cut up by unknown men in bio suites. This film was known as the notorious, Alien Autopsy. The Fox Television Network aired the “Alien Autopsy: Fact or Fiction” special with Jonathan Frakes as host. The special was aired twice on Fox and each time there was in excess of 17 million viewers. Time Magazine compared it to the Zapruder film, saying that no other film has had so much intense debate since the movie that showed Kennedy’s brains being blown out in Dallas. This film was said to be a hoax,however a German film collector, Volker Spielberg bought the rights to the film for an untold sum of money claiming the film was real footage from a German alien autopsy in the 1940’s. Each viewer, regardless of whether or not it was a hoax, now has that snuff film in their consciousness and the ritualistic autopsy that some believed was a satanic ritual performed on a human. The truth is that those who watched the television special do not realize that, even though your eyes saw an alien being cut up, you were also subtextually watching a human being, or an anthropomorphic facsimile being butchered on prime time television. The modern age of the UFO runs along parallel to the history of the Cold War. Both began shortly after World War II during the late 1940s and continued for 4 decades. Those years produced the majority of “classic” UFO cases that fill books, websites and TV documentaries with most of their content to this day. However, it can be said that no documentary or even alien disaster movie could have prepared us for what came next in 1997. By the early 1990s, the Cold War was over. Shortly afterwards, the last flashes of the ‘classic Saucer’ UFO age seemed to blink out with the Phoenix Lights — an event that happened 20 years ago. This incident was different – it appeared to be more omnipresent and yet most people are not even aware that it happened despite the fact that it received mass publicity and was investigated by government officials. It was either the beginning of a real alien invasion, or a psychological operation devised to gauge human reaction to strange activity in the sky. Peter Davenport director of the National UFO Reporting Center called the sighting “probably the most dramatic event in the history of modern ufology” because of the number of witnesses, the size of the craft they reported and the interest the military apparently took in it. There are also other facts about the case that have been overlooked or even forgotten that need to be mentioned in order to determine the impact of such a sighting. It was reported that before the incident that other lights of what appeared to be smaller craft were seen over Arizona before the Phoenix Lights event occurred, it was also reported that whatever this large aircraft was – it was also sighted over Henderson, Nevada and Mexico before it was reported hovering over Phoenix. The event happened in the middle of March, but it didn’t become general knowledge until June 18, 1997, when USA TODAY put a brief headlined, “Skies, phone lines light up Ariz.” on the front page. USA Today gave full coverage with witnesses and a diagram of the large triangle that was sighted over the area. It took three months for the incident to go viral. The internet was already a buzz with the story and it eventually made it to the mainstream. What is odd is that most people don’t even know about the incident or they have mysteriously forgotten about it. This is an important clue because during a meeting of the UFO Congress it was reported that that instead of being awed and immediately wanting to discuss what they saw, some witnesses reported a sort of temporary amnesia. There have been some witnesses who appeared in documentaries that have claimed they watched the lights appear and disappear over a period of time but didn’t say a word about it. One witness had reported that he stopped his car on the side of the road and watched with several others as a craft “slowly glided overhead. Not a word was spoken. After it went on by, everyone got in their car and drove home. There were others who felt a spiritual experience with the UFO sighting, this type of experience was also reported in 2001 over Carteret, New Jersey. On September 6th, 2001, 3 days prior to the September 11th 2001 attacks, there was a major UFO sighting over Carteret. Unidentified objects appeared as lights in a huge V-type formation moving silently through the air over the Arthur Kill Waterway (just South of Newark International Airport). The event was witnessed by hundreds of onlookers, including police officers and a church reverend, the sighting was reported the next day by every major news organization. People that had experienced the sighting actually felt that it was similar to a religious experience. Dr. Lynne Kitei who has been at the forefront of the case was a skeptic who is now a believer concurs with the idea that people felt a sort of spiritual awakening when they saw the sighting. She spoke at the UFO gathering in McMinnville Oregon last year and told us that there has not been one report of harm, threat, or abduction connected with the mass sighting event. She goes on to say that Witnesses were in awe, excited, even grateful to have had such an extraordinary experience. However, that has not stopped film makers from spinning tales of abduction and missing people connected to the event. Another “found footage” film is set to be released next month called “Phoenix Forgotten.” This yet another film that is loosely based on “real events.” The story follows three people who take off into the desert to investigate the UFO sighting and find some alien horrors. I can’t believe we have two movies that are basically the same chronicling a fictional account of abductions when there were some pretty inexplicable moments and terrifying things that happened after the Phoenix Lights event. On March 26th, 1997 Marshall Applwewhite and 39 followers of the Heaven’s Gate cult committed suicide at a home in Rancho Santa Fe California. The bodies were neatly placed on bed with purple shrouds placed over their faces. It was believed that Applewhite had convinced his followers that the Phoenix lights incident was an indication that there was also a ship that was in Comet Hale Bopp and that in order to joining the evolutionary level above human they had to shed their human containers in a ritual suicide. On or around April 2, 1997, an A-10 warplane was stolen by Major Craig Button in Arizona around the time of the sighting. The plane was seen in Utah. The wreckage of the plane was eventually found on April 2nd in the Colorado Rockies three weeks later. It was reported in UFO Magazine that Button was actually aware of what happened in Phoenix and was shaken by the incident. Captain Button turned off his transponder, which made the aircraft difficult to track. His jet was last spotted in the air about 100 miles west of Denver. It zigzagged in the air before impacting the mountainous terrain about 15 miles (SW of Vail, Colorado, on Gold Dust Peak in a remote part of Eagle County. The crash occurred at 13,200 feet of elevation. It took months for a search party to recover the aircraft and Craig D. Button’s remains. The four 500-pound Mk-82 bombs that were on the aircraft were never found despite an exhaustive search involving metal detectors and ground-penetrating radar. However, there has been some speculation that after the sighting in Arizona, Button became obsessed with the possibility of hidden alien bases in the Southwest and decided it was his duty to destroy them. Hundreds of people reported hearing loud explosions in Northern Arizona, Telluride and Aspen. It was a mysterious situation that will never be explained. Some believed that Button was attacking a secret U.S. underground base. However, the government had covered up the situation. On Thursday, April 17, 1997 there was as incredible report that a U.S. satellite, GOES-9, had photographed “a very large anomalous object” over central Alaska 8 a.m. Pacific time. Immediately, the GOES-9 image was posted on several websites, and the news went viral on the internet. A second GOES-9 image, recorded at 8:30 a.m., showed that the “anomalous object” had flown south and was now just west of the northern coast of Vancouver Island. The image also showed “an anomalous object of the same size” over the Pacific Ocean approximately 50 miles west of San Francisco. A third GOES-9 image, taken at 9 a.m., showed the San Francisco object gone and the first object back in Alaska, near Glenallen. A fourth GOES-9 image, taken 11 a.m. registered a new object “half the size of the first two” hovering over Colorado. The first two objects were described as “square or rectangular” and an estimated 25 miles long. At 2 p.m., the Federal Bureau of Investigation issued a “heads up” alert, citing “a potential threat” to the North American Air Defense Command (NORAD) center at Cheyenne Mountain, Colorado, 65 miles south of Denver. Rumors circulated that NORAD had “gone to DEFCON-4 in response to the presence of the “anomalous objects” found by GOES-9. Maj. Gen. Grime told the media that extra precautionary security was needed to protect the 1,100 personnel at the base. Security measures included cancellation of public tours at the center, erection of barricades on the access roads, and a 24-hour-guard on the maintenance portal on the south side of the mountain. The “lockdown” was carried out by 80 troops of the 721st Security Police Squadron. Oddly, security stated that this had nothing to do with the Craig Button Incident. 20 years later we can conclude that there was most certainly an excitement about UFO and space activity. People were looking in the skies to try and find Comet Hale-Bopp and in the process, saw things in the sky they did not understand. One specific object can be seen from different angles, with the angle of the object only reflecting part of its light system, depending on atmospheric or weather conditions, or the very way a witness looks at the object can make this difference. It is very possible that two witnesses can see the same object at the same time, and give two completely different accounts. The event was at first ridiculed by local officials as a trick of light and possible flares from nearby Luke air force base. However, it was later revealed by then Governor Fife Symington and Senator John McCain said the UFO threat over Phoenix was very real and to this day both the wedge “Triangular Craft” and the sightings of orbs remain a mystery. He also made a formal request to the USAF to officially investigate the ‘Phoenix Lights’ incident. 20 years later a report has not been publically disclosed. Frances Barwood was on the Phoenix City Council when the famous mass UFO sighting occurred in 1997. When the media questioned her about it, she asked the rest of the council, because she had not heard about it. They ignored her, and her request to look into the incident. She then set out to find witnesses to the case and has been openly speaking about what happened the night of the event. Janet Napolitano called for an investigation into the Phoenix Lights incident during her 1997 campaign to become Arizona’s Attorney General and was elected to that office in 1998. She has not disclosed any information on the incident or has not revealed what answers she received about the UFO sighting. 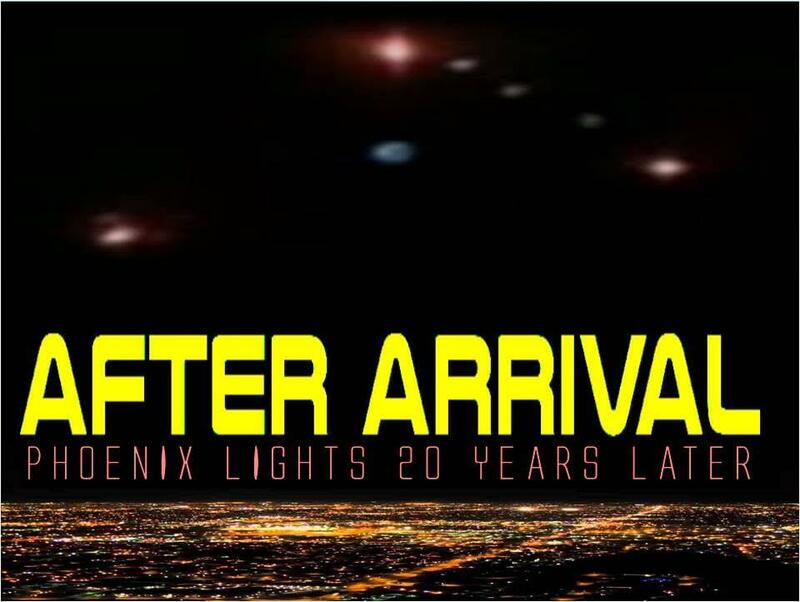 The Phoenix Lights have been arguably the most intriguing UFO sighting to capture the imaginations of not only the citizens of Arizona but also the entire nation.